Dan Kingerski of Pittsburgh Hockey Now: The Pittsburgh Penguins lost defensemen Kris Letang and Brian Dumoulin to injury in the first period last night. A source said that before the game was even over the Penguins were looking for a right-handed defenseman. 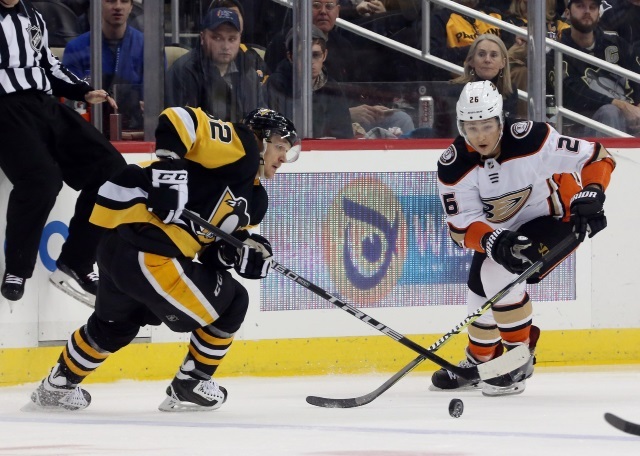 The Penguins may be circling back to Anaheim Ducks defenseman Brandon Montour who has a year left at a $3.387 million cap hit. The Penguins have had their eye on Montour for a while, but it could cost a first-round pick plus more. Another defenseman that might interest the Penguins is Colin Miller of the Vegas Golden Knights. Miller has been a healthy scratch of late. He signed a four-year, $15.5 million extension in the offseason. The Fourth Period: Anaheim Ducks defenseman Brandon Montour is getting some trade interest. The Toronto Maple Leafs, Edmonton Oilers, and New York Rangers are among the teams that have shown some interest in Montour. The Ducks aren’t shopping him, but they are listening. Teams have also asked about defenseman Cam Fowler, but the Ducks don’t appear to be interested in trading him. The Ducks would like to add some offense up front.